A long time ago in 1977, Star Wars (back then there was no ‘A New Hope’ to it) struck a cultural nerve, resonating like a tuning fork to the farthest reaches of the known galaxy. A flurry of rabid fans stormed the theaters, salivating for a product that was by and large rejected at first glance (Fun Fact: Fox had to strong-arm theater programmers by withholding the right to screen The Other Side of Midnight unless they also screened Star Wars, a film 99 out of 100 people probably don’t recognize today.) If they only knew the power of this sci-fi behemoth, one that even today holds the record for second highest grossing film when adjusted for inflation, there is no doubt that they would have flooded their holy grounds with screening after screening of the lauded space opera but history is a fickle thing. Just ask all those people caught on the news praising Episode 1: The Phantom Menace. So let’s cut the bantha fodder and get down to the most important question: Does Star Wars 7 “do”, “do not” or “try”? 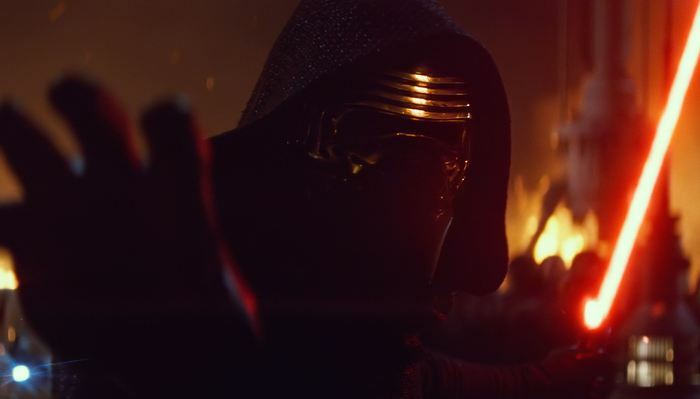 In a binary universe of light side and dark, Star Wars: The Force Awakens “tries” more than it “does”, or “does not”. Meaning, it’s not entirely Yoda-approved. It’s rushed, almost shamelessly derivative, features too many characters with too little bearing on the plot, doesn’t take its time with its biggest reveals and really lacks standout action sequences. Hell, even The Phantom Menace has The Force Awakens beat in terms of lightsaber battles. And I’m a man who loves his lightsaber battles. But, on the other hand, The Force Awakens is also far less scruffy than your average nerf-herder, especially from a fan’s perspective. If we’re comparing it to the prequels, there’s hardly any comparison. And this coming from a guy who enjoys Episode 3: Revenge of the Sith. Abrams and co-writers Lawrence Kasdan and Michael Arndt keep the The Force Awakens‘ till brimming with pangs of nostalgia, sly throwbacks and unexpected rib-ticklers that’ll have you going like Salacious Crumb on a sandy day. George Lucas sparked a touch of interest in those notorious prequels when he noted how he wanted to create symmetry between the prequels and original trilogies by employing a type of visual and narrative “rhyming”. Character arcs would mirror one another (Luke and Anakin, Leia and Padme, etc.) in an attempt to illicit some overarching sense of wholeness. And while we all know that Lucas’ rhyming technique worked out about as well as Joaquin Phoenix’ faux-hip-hop career, Abrams and his crew have chartered a similar path. In following Lucas’ precarious footsteps, they’ve hit the nail on the head like an overzealous Rancor. That is, a bit too hard. 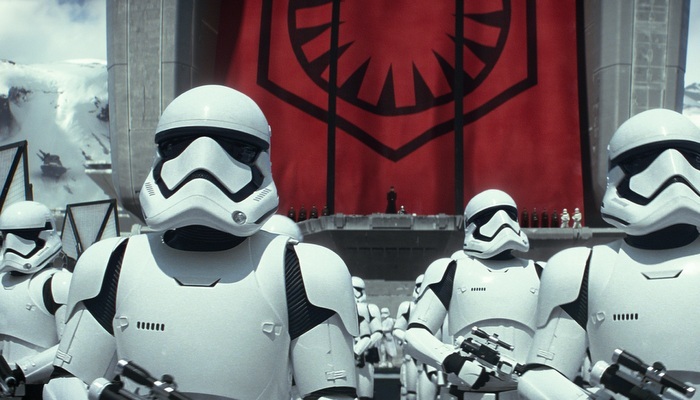 The parallels between The Force Awakens and A New Hope are obvious to the point of derivation. Getting back to the Steve Jobs quote, there is a difference between mimicry and innovation that goes fundamentally misunderstood here. Abrams, who all but rescued the Star Trek film series from a black hole, has given fans what they wanted rather than shown them what they wanted. Fan service is a term thrown around fast and loose but I wouldn’t hesitate a moment to declare that Star Wars: The Force Awakens is the brainchild of fan service done up with all the bells and whistles. This works out in our favor in many capacities. The Lucasfilm production has admirably returned to the retro creature design of yore to create a whole shelf full of print-ready periphery characters that make beholding The Force Awakens a neck-craning process of trying to spy each and every visual reference. They’ve slipped in the customary yaw of new and improved TIE fighters and X-Wings amongst an epic soundboard that’s perhaps the most standout aspect of the entire film. Abrams and company have even showcased the proud stable of lovable characters, you know, the ones not named Anakin or Jar Jar, in an often delightful fashion. It’s hard not to get a rise out of seeing Han Solo (Harrison Ford), Chewbacca (Peter Mayhew) and Leia (Carrie Fischer) all sharing the screen together and there’s some new twists to their relationship that offer humor and heartbreak. In some regards though, this old world meshing with the new incites its own breed of issues, seeing that some new, admittedly intriguing characters are sidelined for the older generation to peacock. 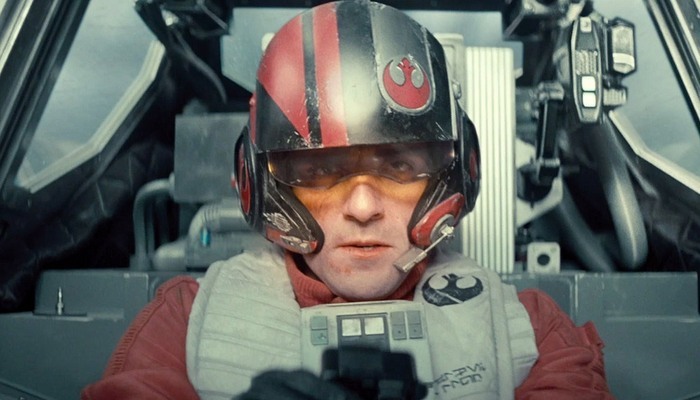 Take Oscar Isaac‘s Poe Dameron for instance. We start the film with Poe, who, in a bit of a gender reversal, plays the Leia role and stuffs a secret map into droid BB-8 for safekeeping. The film’s Darth Vader character (in more than just the looks department) Kylo Ren (Adam Driver), gives Poe the ol’ force pat down before locking him away in a Death Star cell, I mean Starkiller cell (a.k.a. a Super Death Star. As in a Death Star that can blow up MULTIPLE planets at once!). Poe is quickly established as the film’s roguish Han Solo-type but since The Force Awakens already has a Han Solo, we don’t really get to spend much time with him at all. Instead, his development seems shelved for later installments. A great tactic to get butts back in theaters for the next round a few years down the road but also one that leaves The Force Awakens lacking in the stand-alone department. 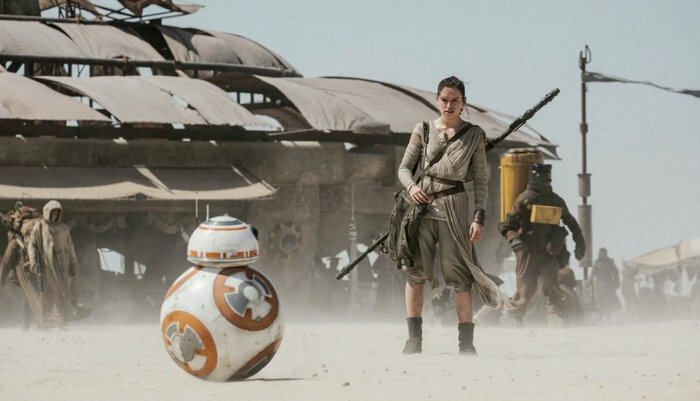 And if we were to simplify the modus operandi of The Force Awakens down to one primary function it would be “set up.” There are elements in and of itself, particularly the relationship between Finn (John Boyega) and Rey (in a simply fantastic debut from Daisy Ridley), that feel complete, or at least arch-y, but there’s also a good amount of it that feels half-baked or hurried. Kylo Ren for instance is lacking the supreme cool that made Darth Vader such a memorable contender and the context that makes him so complex. In that regard, Abrams wants to have his cake and eat it too. He wants to hustle everything into one movie because it’s his only shot. Let’s just say that there’s a long way to go to tell if this kind of kitchen sink storytelling can pay off big somewhere down the line. When the lights go down and the Lucasfilm logo flickers that faint Greedo-green, when that signature text crawl explodes onto the screen, dished up with John Williams triumphant brassy lick, when the camera pans down to reveal a massive looming spacecraft over a luminescent planet, you won’t have to search your feelings to tap into that sense of childhood wonder. But as Star Wars: The Force Awakens begins to take shape and look distressing like the product of a long time ago, you may find yourself questioning the dark tactics of overloading on sugary sweet nostalgia at the expense of true innovation. CONCLUSION: J.J. Abram’s employment of nostalgia, character camaraderie and practice effects in ‘Star Wars: The Force Awakens’ helps right the ship wronged by the George Lucas’ prequels, though it’s still not entirely fulfilling as a standalone story. Falling somewhere in the middle ground between the two trilogies, Star Wars 7 is a kessel run’s distance from amazing but could prove a necessary building block upon which the incoming sequels can add depth of character and story. This entry was posted in Out in Theaters and tagged Adam Driver, Carrie Fischer, Daisy Ridley, Harrison Ford, J.J. Abrams, Lawrence Kasdan, Michael Arndt, Oscar Isaac, Out in Theaters, Peter Mayhew, Reviews, Star Wars: The Force Awakens. Bookmark the permalink.